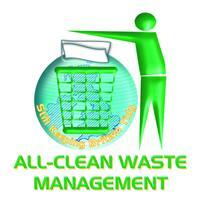 All Clean Waste Management - Rubbish/Waste/Clearance based in Ferndown, Dorset. I am Steve and I'm located in Ferndown Dorset, I own the company . I have been working in the waste industry since 1999, I have witnessed the changes and see the importance in keeping up with the regular changes that the waste industry brings. We will clear or consider any task related to the waste industry , with our WAMITAB (Waste Management Industry Training and Advisory Board) qualification we could legally operate our own landfill site - we do not but we do have the knowledge . Our minimum is to bring you a good honest service, politeness and the utmost respect and of course cleanliness around your surroundings .